Gluten Free & Allergy Friendly: Lunch Made Easy: May the 4th be with you! Lunch Made Easy: May the 4th be with you! 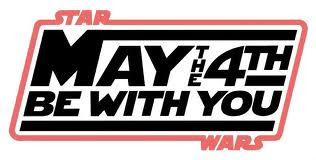 Friday is May the 4th. Better known as Star Wars Day! I had originally planned to do a Cinco de Mayo themed lunch for Friday, but after my fellow bento bloggers wanted to do a hop for Star Wars, I decided to let Little Miss choose. I was certain she would choose Cinco de Mayo, being that we just went to Mexico in February and she loves taking Spanish in school... to my surprise she excitedly answered "Star Wars!" Ewok: Little Miss has half an Udi's (gluten, nut, soy, & dairy free) bagel sandwich. It's filled with turkey and cheese. I made his facial features from cheese and an all-natural apricot fruit strip. It was actually really funny, when I finished him the fella came up behind me and made that little noise the Ewok's make. Haha, that made my night. Yoda: He's a happy Yoda. Probably because he's made from Udi's bread and filled with SunButter and jelly. They're both laying on a bed of baby spinach and have grapes scattered around them. Lightsabers: Chobani Champions Chocolate Chunk greek yogurt with sprinkles used to make the lightsabers. Little Miss' reaction: "Cooooooooool!!!! You're da best Mama!" She asked if I could drive her to school in the AM so she could be extra special careful not to move anything she said. LOL she apparently told her WHOLE class she was getting an awesome Star Wars lunch Friday. 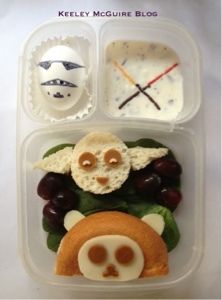 Everyone will be posting their Star Wars themed lunches on Friday! Click the ^ button to follow along and see all the amazing ideas! I may have put her up to a FUN challenge on this one with a particular theme to her post, hehe, I can't wait to see it! I love that the fella spoke Ewok! Mine just shook his head. Of course, mine was loooking at Barf ;) Super cute lunch, Momma! So cute! Love the boiled egg stormtrooper! Love the detail of the storm trooper and the sprinkle light sabers! Yoda and your Ewok came out amazing! Great lunch! Ok....I really can't decide what I love more. The sprinkle light sabers, trooper egg, ewok or Yoda! Your creativity is on-fire for this lunch homie! WOW! 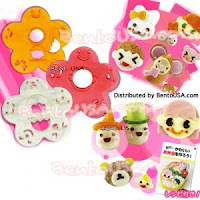 Such cute details in all of it! Light Sabers from sprinkles? Wow! I love everything in this lunch Keeley! Amazing, talented job! I love your light sabers in the dip! The whole meal is awesome! Very healthy and creative bento, Keeley. I will definitely have this in one of my son's lunches. We love Chobani Champions too. That Ewok is the cutest darn thing eva! Great job!!! I love the Ewok so much! Its chibi Ewok (and brilliant light sabers)!